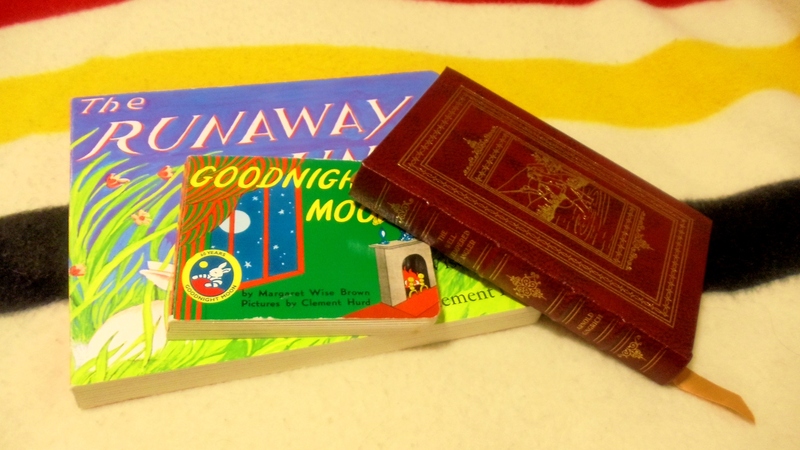 The Runaway Bunny, Goodnight Moon, and The Easton edition of The Well-Tempered Angler. Each night, my wife and I enjoy reading books, telling stories, and singing songs to our daughter before she goes to sleep. Later on, we often read to each other, too. Our daughter tends to favor “big” books. That is, books that will take a long time to read and allow her to stay up just a little bit longer. Fortunately, she has a pretty great selection of books. One of her “big” books is The Runaway Bunny, authored by Margaret Wise Brown and illustrated by Clement Hurd and first published in 1940 (and continually in print since). Wise Brown and Hurd also collaborated on a later, better known book, Goodnight Moon (1947). In this second book, there are some interesting pictorial allusions to The Runaway Bunny. I am always happy when our daughter wants us to read The Runaway Bunny. It is a touching story about a “little bunny,” who wants to run away from his mother. His mother insists that she will follow him everywhere, always bringing him back to her. “Little bunny finally says to his mother, “Shucks, … I might just as well stay where I am and be your little bunny.” It is a sweet story, and it certainly has greater depth than the average story written for children today. 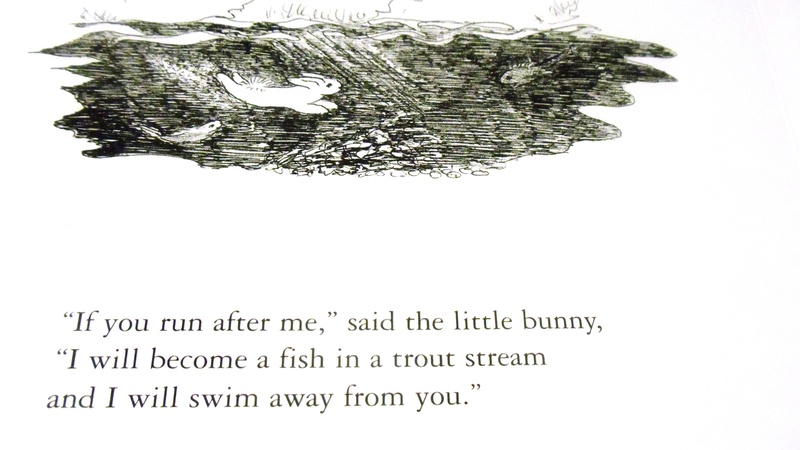 What interests me most about The Runaway Bunny, however, is that little bunny, in the course of the short narrative, decides that he will “become a fish in a trout stream” and swim away from his mother (which, perhaps, displays some influence from Celtic mythology). 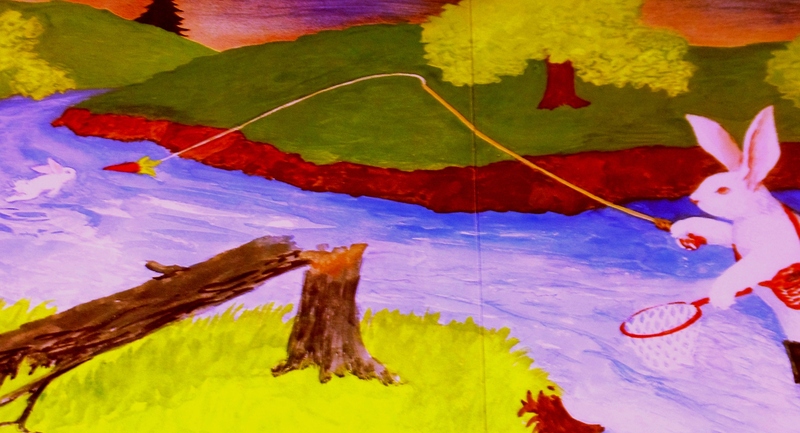 To this, his mother responds, “I will become a fisherman and I will fish for you.” Below, you can see the illustration of little bunny swimming with the trout. Following this page and the next, there is a full-color picture of his mother fly fishing for him with a carrot “fly.” Great stuff. After my daughter falls asleep, and after my wife and I go to bed and finish reading to each other, I often pull out another book. Often, it is a fly fishing book. As much as I love Runaway Bunny, though, I always turn toward something more adult. Not infrequently, I reread Arnold Gingrich’s The Well-Tempered Angler (1965). Gingrich was the founding editor of Esquire. In his magazine’s pages, Gingrich published pieces by authors who would eventually be considered among America’s greatest. Ernest Hemingway is just one example. I point this out simply to indicate that Gingrich understood great writing, and he was a pretty darn good writer himself. I might add, too, that his book, The Fishing in Print: A Guided Tour through Five Centuries of Angling Literature (1974), is by far the most extensive, annotated bibliography of fishing literature ever published. If you have a young child, be sure to share The Runaway Bunny with her or him. And, if you love fishing literature yourself, Gingrich’s The Well-Tempered Angler is a must read. He wrote amusing, compelling essays about fly fishing long before the likes of John Gierach put pen to paper (or finger to key). Finally, if you happen to be a parent and a fly fisher, well, you might consider both books. This entry was posted on March 24, 2012 at 11:16 PM and is filed under Fly Fishing Literature, Uncategorized. You can follow any responses to this entry through the RSS 2.0 feed. You can leave a response, or trackback from your own site. Nice to see. Thank you. Wondering how I might find out whether or not I could use one of the images from this page on another website? Just ask, Suzanna. They are either my own pictures or they are in the public domain.